It proved to be a successful event this past Thursday as Research Managers and Senior Library and Information Services Managers came together for a full day of presentations and discussion. The conference, organised by the CRC (specifically us working on the JISC funded RCS project), ARMA, RLUK and SCONUL focused on the growing need for integration between research support and information services. The morning started off with introductions from Bill Hubbard (CRC), David Prosser (RLUK) and Ian Carter (ARMA), who set the appropriate tone for the day. Stephen Pinfield (University of Nottingham) then gave us an introduction to the work being done at Nottingham with their OA Publishing Fund, put in place to meet the need set by Funders’ mandates. Stephen went on to describe the cost of OA publishing (Gold road) at the University of Nottingham, pointing to the Houghton Report – and commenting that it is probably the most important report for those working in this area. Stephen also described how OA publishing is generally cheaper for the University of Nottingham using this modelling. 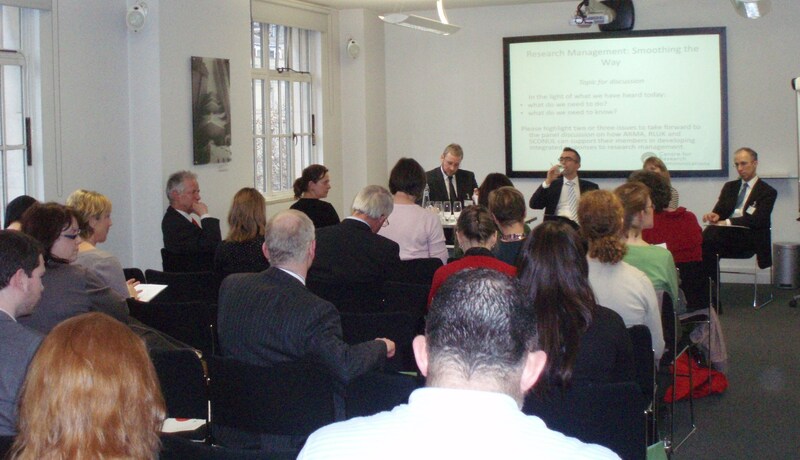 Robert Kiley (Wellcome Trust) and Gerry Lawson (NERC) each gave us a funders’ perspective. They described some of things funders need, one thing in particular that was discussed was the need for proper grant acknowledgement and attribution, with grant number, in a standard form. Many key players were present and it was good to get them all in the same room and let them hear each other’s thoughts and concerns. The full programme and some of the slides are available here. We may try and repeat the event or do something similar in the future so please do let us know if you are interested. Hope everyone has a lovely Christmas and a Happy New Year! Open Access and other developments in research and education have often been inaccurately characterised as taking place between two opposed “sides” – between publishers and institutions or their libraries. Quite apart from the combatative nature of such a characterisation, such a picture is not helpful because of the complexity of even these two stakeholder groups (let alone the funders, and the researchers as the key players in research). For instance, institutions often have University Presses as publishing businesses within their organisations. There are purely Open Access publishers who have a vested interest in the success of the OA model. There are traditional publishers like Springer who claim to be happy to provide any particular access model wanted by the user community, as Wim van der Stelt explained at a recent RSP event. It now looks like things might get even more complex, with the news that the publishers Pearson are proposing to apply for independent degree-awarding powers . As a company selling educational resources, it would be interesting to see how certain issues may be resolved. For example, would they recommend OA educational resources as an alternative to their own products for cash-strapped students or for staff that want to use good material from elsewhere? If such OA resources – or research-ouput resources – were CC licenced for non-commercial use, would it matter if the institution was being run as a commercial enterprise? 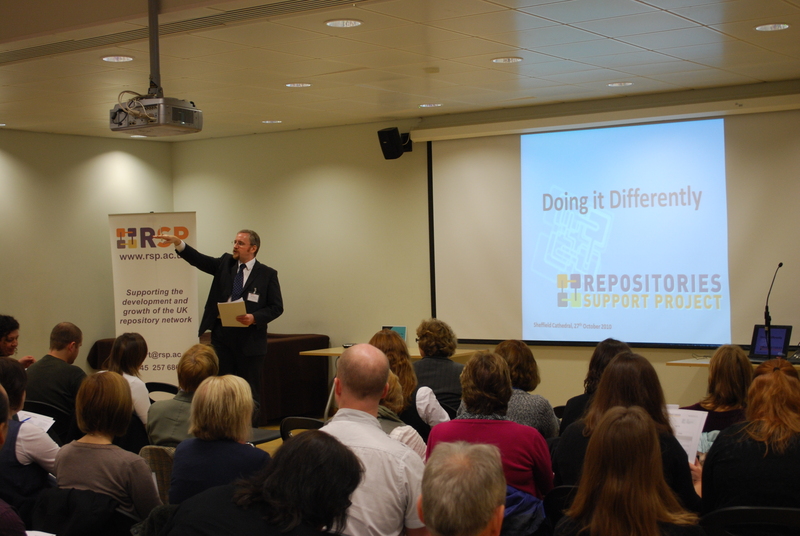 Yesterday I helped out at the RSP event, “Doing it Differently”, held at the Sheffield Cathedral. It was a very interesting, full day. The series of talks showcased alternative approaches to repositories, open access and scholarly communications, with the audience mostly repository managers and others working directly with repositories. So many different and exciting things happening in this area! Pat Lockley, from the University of Nottingham gave a lively presentation on Xpert, which is a “distributed repository of e-learning resources”. Stephanie Meece discussed the difficulties of managing repository deposits that are non-text based, and demonstrated the amazing work done at the University Arts London. Their repository, UAL Research Online, does a fantastic job of storing and showcasing non-text based research material. Jason Hoyt from Mendeley described some of their new developments as well as their involvement with the JISC funded Direct User Repository Access (DURA) project. Sally Handford, also from the University of Nottingham, described her involvement in iTunes U at Nottingham. These projects are definitely worth checking out. I could go on, but I won’t. You can find the programme for the day, as well as slides and handouts to these talks and others here. It’s International Open Access Week! And there are a tonne of great things going on. Check out the SPARC Open Access Week site for more on what’s happening, and see the RSP blog for a list of what UK repository managers are doing to promote open access this week.